DON'T DELAY - Log your "Will Attend" today! Make sure that you don't miss this event: A Mega Event is a MUST attend event. It has its own special icon and has a number of requirements attached to it. Mega Events do not happen often, but thanks to the wonderful geocaching community in South Africa, we will have an annual Mega starting from this year, right through to 2016. 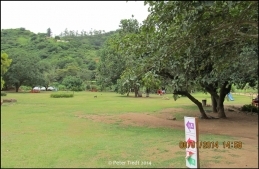 This year's Mega will take place at Giba Gorge, Durban from 4 to 6 October 2014 (during the school holidays), and the next one will take place during 2015 in Cape Town. The Cape Town Mega Planning Committee was established last year and they are working on the details of the event. When the date and venue have been confirmed, we'll update the community. The enthusiastic Port Elizabeth community is organising the Mega in 2016. Planning for the PE Mega is already well under way and the event will take place on 01 May 2016. Please arrange your holidays and leave to coincide with these important dates - 2014 and 2016 have been confirmed. We'll publish the details for 2015, once we have confirmed both the venue and date for the event in Cape Town. The Groundspeak requirements for MEGA status, require that we MUST HAVE a minimum of 500 people attending each Mega. Groundspeak also requires indications of the planned attendance prior to awarding MEGA status to the planned event: PLEASE ensure that you log your "Will Attend" to help us to ensure the status of these events. After submitting your log, plan your trip for an unforgettable caching experience! 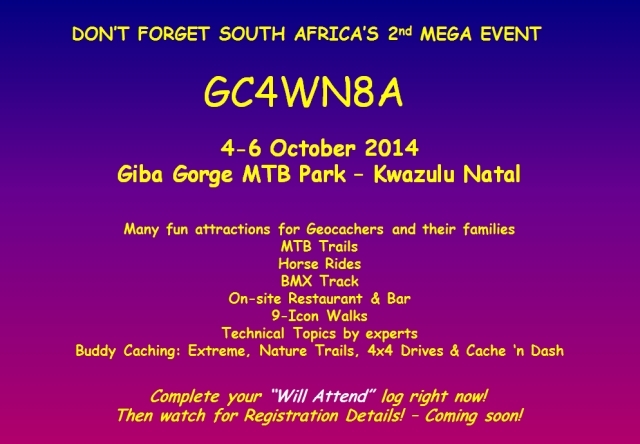 The second Mega will be held in Durban from 4 to 6 October 2014 at Giba Gorge. Please log your "Will Attend" right away! There is much excitement within the South African geocaching community as the planning for the next Mega is in full swing and all hands are on deck. The Kwazulu-Natal community is excitedly getting ready to host the next major event in any Geocacher's "To Do" list. The Mega is in the initial planning phase and an event listing has been published recently. Groundspeak will only award official Mega status, once the number of "Will Attend" logs has reached 250+. MEGA Events are very large events filled with activities, caching, workshops, and lots of "kuiering"! The Durban committee will communicate further developments as they unfold, so put the listing on your watchlist. You can also keep up to date through the Facebook Group - Geocaching SA.